After having months' worth of composting material turn to dust after sitting above the most worthless of moisture-sucking dirt in my back yard, I decided to build a compost box. 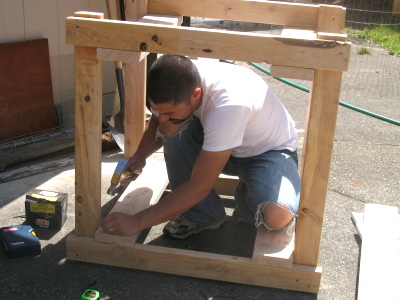 Here's me building the frame. I used up all the scrap lumber I had sitting around from some of my other projects around the house. 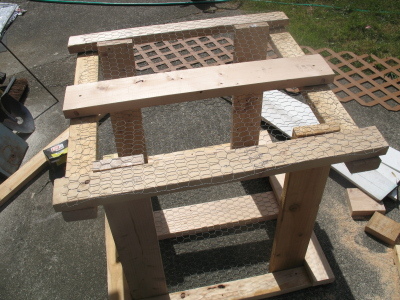 In addition to lumber, I had some spare chicken wire and some plastic wicker fence headings that I nailed to the frame to keep the compost contents inside. And here's the composter. If it doesn't do a good enough job keeping everything inside contained and at a good composting temperature, I may cover the whole thing in a black tarp and seal it up really good. I also plan to put the whole thing on a rotisserie so I can spin it to rotate the contents. I've since covered it in black heavy-duty plastic to trap the heat and moisture. It should help the decomposition process more effectively, I think. 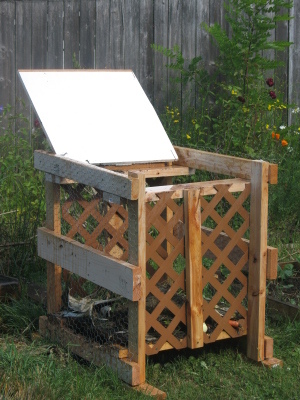 I still need to get it set up on a rotisserie, though... trying to get a pitch-fork into that compost box to turn things over isn't really going to work.